Avocado, Rice Bran, Sweet Almond, Coconut, Hazelnut, Sunflower, Golden Jojoba, Macadamia Nut, Meadowfoam, Kukui Nut, Wheatgerm and Vitamin E oils. I created this blend of oils specifically for my savvy customers who are learning to create their own Aromatherapy Body Oils. Add your selected essential oil blend to this product and you have a fabulous Facial Oil, Body Oil, Facial Cleanser; or use it plain without any scent -- it's perfectly wonderful just as is and has a subtle, just slightly nutty scent. These selected oils are very beneficial all on their own. Trust me, once you begin using Body Oil you'll never go back to lotion! 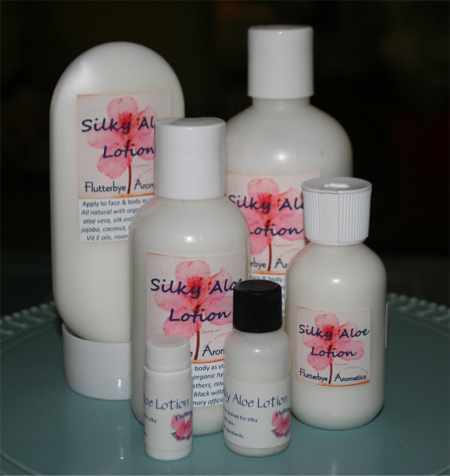 Ultra creamy face and body lotion with silk esters. Absorbs immediately, leaves skin feeling silky and smooth, does not feel greasy or slick. Unscented to avoid conflict with your perfume scent, but certainly add your essential oils if you like. Moisturize face and neck every morning and night after cleansing and toning. Always moisturize your face and neck in upward motions. Facial moisturizing is important for all skin types. Apply to entire body as often as needed throughout the day to hydrate and nourish the skin. There's a good reason our LOTION BARS are one of our most popular items -- they've even been called "pure indulgence." These Lotion Bars are the perfect soothing solution for skin care. The calming and regenerative qualities of the essential oils, combined with super moisturizing Shea Butter, Aloe Butter, Mango Butter, along with Sweet Almond, Avocado, Vitamin E and Meadowfoam oils synergize with natural beeswax to create a deep-penetrating moisturizer. And of course the Emu Oil in the Emu Bar works miracles! The Lotion Bar melts with your body temperature as you glide it over your skin. 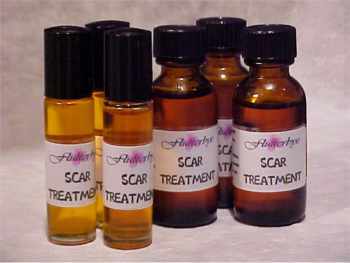 It is especially effective in softening dry heels, elbows, and preventing stretch marks. The BABY BAR is excellent for babies, of course, but it's also great for the expectant mothers' belly and for children of all ages (yes, even adults!). These bars are especially good for anyone who washes their hands frequently. The beeswax forms a protective seal to hold in the moisture. Shea Butter helps to restore the skin's natural elasticity and reduce scarring. Enables your skin to draw moisture from the air, and as a result, skin becomes softer and stays moisturized. Shea Butter does not rob the skin of its natural oils (like petroleum jelly and mineral oil do) and can actually help stimulate collagen production. As such, it can be very effective in helping to alleviate wrinkles, scars and burns. Shea butter absorbs rapidly into the skin without leaving a greasy feeling. Beeswax helps to seal in the moisturizing butters and oils. It helps to penetrate, soothe and protect rough, dry, chapped and irritated skin while leaving the area smooth and soft. Beeswax is nature's perfect bacteria-resistant and non-allergenic moisturizing and healing agent. 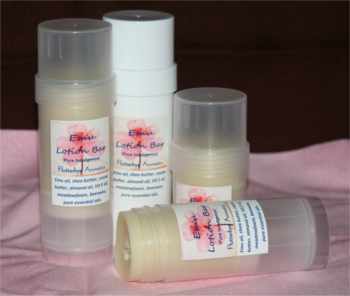 With our lotion bars you won't have to worry about bottles or tubes leaking in your purse. A Flutterbye Lotion Bar is the perfect alternative for travel -- no liquid, so it's airline approved to carry in your bag. 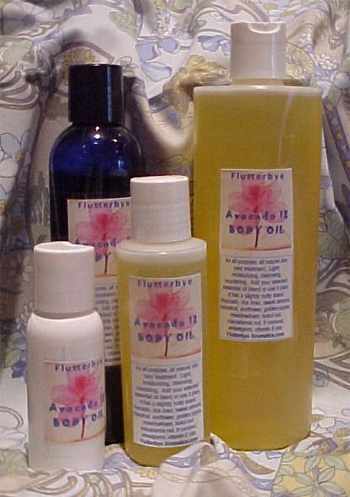 I absolutely love the light almond scent here and the amazing properties that the Abyssinian oil brings. *Abyssinian oil has a unique molecular structure not found in any other natural oils. This makes it spread very easily without feeling greasy and it has excellent nourishing and moisturizing benefits for the skin! Very lightly scented with chamomile, lavender and dill ... the most important ingredients here are the butters, oils and natural beeswax which nurture and protect the skin. The same luscious ingredients go into this bar with the addition of our proprietary blend of insect repelling essential oils. 100% all natural and safe for all ages. Goes on smooth and lasts a long time. This general purpose lotion can also be used on babies and children; especially luxurious after a warm bath. Rub between palms and then apply. This lotion was requested by several customers and I can definitely see it being used as a solid perfume by those who love the orange blossom scent! Made with our luscious formula for beautiful skin. A very sensual combination -- this is lovely combined with the Orange Patchouli soap. This lotion is lovely used as an all over body lotion applied directly to the arms and neck; top it off with Rose Powder! Made with our luscious formula for beautiful skin. Unscented but has a natural subtle nutty fragrance from the unrefined shea butter. Extremely beneficial to skin. SHEA BUTTER is the ultimate for face, hair and all-over body moisturizing. Rich in vitamins A, E and D, shea butter leaves skin feeling baby soft, in fact it's even wonderful for babies! Whipped to a creamy silk that melts upon contact with your skin, you only need to use a small amount, it spreads nicely, absorbs quickly, and lasts a long time. Made with pure Uganda Gold Unrefined Shea Butter, Kokum Butter, Jojoba Oil and essential oils. Whipped Pure Shea Butter for all-over body moisturizing, head to toe!